Red was a guy whose life overlapped with ours for a period in the late 2000’s. 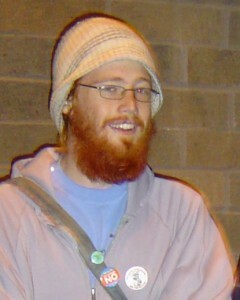 In the gang of activists we hung out with at the time, he was the energetic bike freak with the fiery red beard. 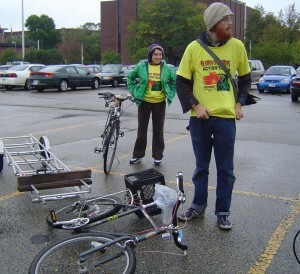 As a student at UW-La Crosse, he helped start a program that reclaimed and rebuilt discarded and abandoned bicycles. While helping us with the last Spokes’n’folks parade in 2006, he connected us with the eight-foot trailer that eventually became ours. He delivered the trailer with a double-decker bike he had recently built, and took a little time to ride it around in the alley behind purplearth world headquarters. In March 2010 he hosted us at Nottingham Co-op during one of our visits to Madison. He was happily working at a local bike shop, and the last time we saw him was when he walked with us to the bus stop, carrying our bikes in a cart he built from recycled bike parts. Since then, Red continued to work in that same bike shop, and embarked on frequent cross-country bike tours. It was on one of these tours that his life ended. On his way to New Orleans for Mardi Gras, Red was hit by a van on a highway in Mississippi and he died at the scene. Being 150 miles from Madison, we couldn’t get there for the memorial (like Red, we don’t have a car), but we thought we’d share the video above, the images below, and links to his obit and a story done by a Madison TV station. Red (aka Christopher Vogts) and another activist prepare to enter Senator Herb Kohl’s office in La Crosse as part of International Peace Day in 2006. More demonstrators at Herb Kohl’s office in La Crosse on International Peace Day. Red was very much at home where bicycles and bicyclists congregated. 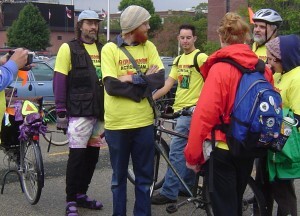 This entry was posted in Activism, Bicycling. Bookmark the permalink.